To begin, measure the tape to the desired length. Using Teflon coated scissors, round the corners so they don’t catch on clothing and peel off. For the best results, properly prepare the skin prior to applying TheraBand Kinesiology Tape. 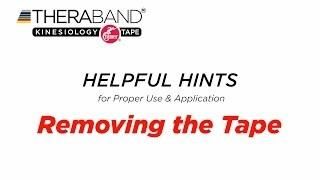 To avoid irritation, remove the tape slowly. Press down on the bare skin closest to the tape being removed as you slowly pull the tape. Before you begin, make sure you are executing the tape and spray application correctly to deliver a safe, effective result. 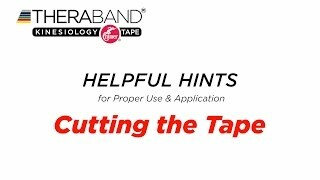 Break the backing of the tape simply by pulling it apart. Avoid touching the adhesive. Use the backing paper to rub the tape to ensure proper adhesion. TheraBand Kinesiology Tape may be worn for up to five days. 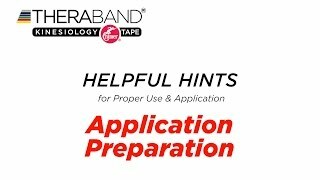 Use a towel to pat dry the tape after getting it wet.